This holiday weekend, anyone who was watching CBS in Boston got to see some amazing shots of fireworks. 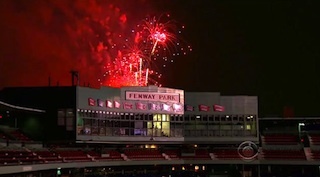 In fact, the footage was way more impressive than those on other networks as it featured incredible glimpses of the fireworks going off right behind such landmarks as Fenway stadium and the state house. However, some eagle-eyed, geography-knowledgable viewers began to notice something was amiss. The fireworks were shot off from a barge and for CBS to have gotten some of the shots it got, the barge would had to have planted its anchor right in the middle of the street. The producer of the show has since admitted faking the footage. Not only has he admitted it, he’s standing by the choice. “David Mugar, the Boston-area businessman and philanthropist who has executive produced the show for nine years, confirmed yesterday that the footage was altered. He said this was the first year such alterations were made. It’s just another step into our new era of complete artificiality, a world where our “reality” television is more scripted than the rest, people walking down the street are 50% plastic, almost every picture is photoshopped, and no movie stunt is impressive since it was probably CGI anyway. Why not fake Fourth of July celebrations as well? This all, of course, brings up a number of questions about reality and the eternal fight between aesthetics and verisimilitude. And one other big question as well: what’s the point in watching fireworks on TV anyway?